Shortly after having my second child, I had to give up coffee. Looking back now it was probably the best move ever for me, but at the time it seemed like the end of the world. With the endless nights of breastfeeding a newborn and the sleep deprivation that came, all while trying to care for a toddler too, I wanted coffee more than anything. “Why did I give it up?” You might ask. I will tell you why. I noticed whenever I drank even the slightest bit of coffee, my daughter wouldn’t sleep well at night and wouldn’t take naps during the day well either. So not only would I be sleep deprived but I would also have to deal with a very cranky over-tired baby. Its funny she was so sensitive to caffeine because I have always been very sensitive to it too. Coffee has always made me wired and jittery so I would just allow it in tiny bits or drink half-calf to deal. But this situation called for a complete cessation and I was desperate for something else that could help me stay alive during that crazy post-partum year. I had heard of matcha but I wrongly assumed I could handle it because it was still caffeine after all. But then I read about its alerting but calming affects and I thought “That’s exactly what I need!” So I gave it a try. I was surprised at how it gave me a little boost of energy but never made me (or my babe) feel jittery one bit. I was absolutely in love. Then, I began to research the benefits and I was floored at how nutritious matcha was and how beneficial it was to my body. It was exactly what I needed! 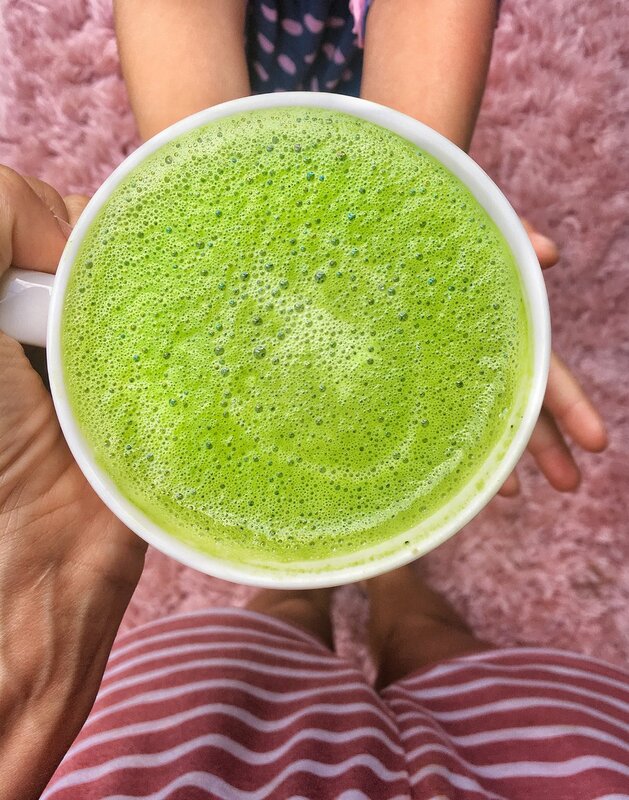 So without further ado, I feel I am way over-due to share my favorite Mushroom + Matcha Magic Latte recipe with you. I have been drinking it for about 2 years and I have tried almost every organic matcha brand under the sun. This brand I use doesn’t even compare to the other brands on the market. Its quality and taste is above and beyond anything else I have tried in the past. I use my favorite Ippodo Tea matcha and mix in a bit of my favorite immune supporting Red Reishi mushroom powder and it’s a wonderful, magical thing that gives me mom super powers and just makes me so happy, you guys! Red Reishi is an incredibly powerful mushroom, that has been used for centuries for its healing and longevity properties. It’s been studied extensively for its anti-cancer and anti-tumor properties (breast cancer, prostate cancer, leukemia, just to name a few) It improves liver detoxification pathways, protects against infection, fights asthma + allergies, promotes better sleep and stabilizes blood sugar. Heat up 1 + 1/2 cups favorite nut milk in a pot. Blend with a hand blender and enjoy! Any of the products on this page may be an affiliate link. If you click on an affiliate link and make a purchase within a specific amount of time, I get a small commission. The commission is paid by third parties, not by you. I only recommend products that I genuinely love. Thank you for your support! This smoothie is so packed full of delicious nourishing ingredients, that you and your kids will both feel like you have super-hero powers after drinking it down! Or if you’re like me, and have been eating junk while traveling for the past week or so, it will give you a quick jump start to detox your body of all the toxins. It has all you need, really! Lots of fresh greens, healthy fruits + healthy fats from the avocado, what more could you need to start your day? Did you know mangos are packed FULL of antioxidants and are known for promoting healthy skin and digestion?? Their high antioxidant content has been known to prevent cancer and they also contain many trace minerals that are lacking in the average American diet like potassium, magnesium and copper. Who knew something so deliciously sweet could be so healthy? Blend all ingredients in high power blender until smoothe, add ice at the end until desired consistency is reached. Tell your kids they aren’t allowed to have any! With flu season in full swing, my whole family fighting a cold of some sort and Christmas travel plans looming in the near future, I decided it was time to break out my dear old friend, the Anti-inflammatory Turmeric Lemon Ginger Tonic. No, this is not a smoothie, but if you’re like me and love lemons and don’t mind a little kick, you could probably drink it down like it was one. Instead, I take one shot sized sip of it first thing every morning when I’m trying to be preventative against colds and viruses or when anyone in my house is sick. Inflammation in the body has been linked to so many diseases including heart disease, cancer, diabetes, depression, obesisty, Alzheimer’s, etc. It is also thought to be a pre-curser of sorts to premature aging. Unfortunately, many people walk around in a chronic state of inflammation without even realizing it. Here are a few reasons inflammation can develop. Besides looking at this list and trying your best to eliminate as many factors as possible, there are some powerful anti-inflammatory foods that can significantly decrease inflammation in the body and help prevent and fight disease. Turmeric is a bright orange spice known for its anti-inflammatory, antioxidant, antiviral and anti-cancer properties. It is what gives curry its orange/yellow color. Basically, this spice wards of disease, you guys. If you have never experimented with adding it to your diet, you need to ASAP. While Indian cultures have long revered this spice and used it to treat wounds, infections and cure other diseases, the western world is just beginning to acknowledge its powerful medicinal properties. Several studies have shown its effectiveness against treating cancer. Ginger is another one of the most healthy spices in the world. It also has powerful anti-inflammatory and antioxidant superpowers. It has been used for medicinal uses for centuries to aid in digestion, treat nausea and fight off the Flu and common cold. Raw honey contains bee pollen, a super nutritious compound containing powerful antioxidant flavonoids, vitamins and minerals, and enzymes. It has been known to fight seasonal allergies, help with a nagging cold or cough, and fight disease. Unlike store bought, commercial honey, which has been heavily processed, chemically refined and heated to a degree which renders vitamins, minerals and enzymes unusable, raw honey has all of those properties intact in an easily absorbable form. Lemons are densely packed with vitamins and minerals including vitamin C, vitamin B6, vitamin A, vitamin E, folate, niacin, thiamin, riboflavin, pantothenic acid, copper, calcium, iron, magnesium, potassium, zinc, phosphorus, and protein. Garlic has powerful medicinal properties as well, known for curing the common cold, aiding in digestion, fighting disease including cancer and heart disease (by lowering blood pressure.) It is also another powerful antioxidant and is known for its antiviral properties. A healthy source of Omega-3 fatty acids. These healthy fats helps the absorption and assimilation of all the other ingredients into the body, especially Turmeric. It is a well known fact that black pepper can increase the absorption and bioavailability of Turmeric into the body. So now that you know the method behind the madness of why anyone would take a shot of this spicy and sweet concoction on a regular basis, here is how I make this little miracle working tonic. Blend all ingredients in high power blender until smoothe. Store in a container with a lid in the refrigerator for about 1- 1 1/2 weeks, take one or two shots daily to ward off illness. Be warned, it is VERY spicy! I actually enjoy the flavor a lot but my husband and some other friends I have had try it have a hard time getting it down. Add as much raw honey as your heart desires to make it palatable! I am always on a mission to find ways of getting more greens into my own diet and my children’s. So when I find a green smoothie that both kids and I LOVE and keep asking for more of, I take it as a indication that I should write this one down. This smoothie is so refreshing, what a wonderful way to start your morning! Not only is is packed with lots of Vitamin C and healthy greens, but it also has some healthy fats from the coconut milk to keep your tummy full and give your brain a little boost. Blend all ingredients in high power blender until smooth. I'm wild about finding ways to add superfoods like kale and beets to my diet. And when I find a way to sneak them into a drink that my kids will actually drink, I get really nerd-like excited. That's why today I am sharing with you a recent favorite of ours, the Purple Superfood Smoothie. Most of you already know how much of a powerhouse of nutrition kale is. It contains high amounts of vitamin A, C, K, Iron, Calcium, and other vital nutrients. It's also good for your heart, is high in antioxidants, fiber and is very anti-inflammatory. Improve liver health and function - A healthy liver helps your body to naturally detox. Prevents against certain cancers - Studies have positively correlated beet consumption to protecting against skin, lung and colon cancers. Naturally high in folate - This makes beets the perfect vegetable for pregnancy, as folate helps to develop a healthy spinal column. Naturally high in Iron - Prevention of anemia. High in Potassium- The potassium content of beets can prevent blood clots from forming, lower your blood pressure & ward off strokes. Support detox - The betalin pigments in beets support the bodies detoxification process. Okay, okay. You get the point, beets are an often neglected superhero of super-foods. Bottom line here, find a way to eat more of these little guys. Be warned though! They will stain everything in sight, including your ungloved hands and pretty white cutting board. In my opinion, the benefits far outweigh the stains. So here it is, I hope you love it as much as I do! Blend all ingredients together in high powered blender until smooth. Well I guess it’s about time I shared this little number with you. If you're anything like me, you go to bed dreaming about chocolate and wake up needing it ASAP. I'm happy say I finally found a healthy way to curb the craving as soon as it hits (even if it is 6:30 am). Firstly, I will openly admit that I have been very into/borderline obsessed with finding ways to incorporate dark chocolate into all things edible as of late. I’m just addicted to it plain and simple. Secondly, it’s such a powerhouse of nutrition, can you really blame me? If you missed my post a few weeks back about the health benefits of organic cacao, check it out. Anyhow, this smoothie has been on repeat in my house lately and no one is complaining! It is so good!! Honestly, it tastes like a chocolate milkshake from Wendy’s in a non fast food guilty sort of way. Not only does it contain the superfood cacao but it also contains frozen cauliflower, so you’re getting in your veggie for the first meal of the day. Don’t worry, cauliflower is like a ninja, you can’t disguise it however you want to! I also would like to add this smoothie gives me a ton of energy and the kids love it too! Starting with the milk of your choice (coconut/almond/hemp), add all ingredients and blend until smooth. It doesn't get much better than a strawberry banana blueberrie smoothie does it? I'm pretty sure everyone needs a basic go-to berry smoothie in their life. This might be one of my kids' favorites. My three year old usually screams "yay the purple!!" when he sees this guy coming at him. Since it's technically a protein shake it can count as a whole meal too! Perfect for breakfast before school or snack on the go. Frozen berries are seriously my jam. I love when I am out of fruit and veggies by the end of the week but remember about my frozen berry stash to add a bit of color (and enzymes) to the meal. Do I need to fill you in on the health benefits of blueberries? They are potent in the antioxidant department and they are a powerful food for supporting brain neuron health. See my previous post entitled 8 Zero-Prep Snacks That Will Give Your Child the Nutritional Fuel They Deserve to learn more about the superpowers of blueberries. Bottom line, you need more frozen berries in your life. Okay here it is guys, enjoy! If you have yet to jump on the green smoothie train, now is the time. This Lemon Papaya Green Smoothie is so delicious it will leave you and your kiddos asking for more! The subtle but sweet flavor of the papaya and the refreshingly tangy lemon flavor give this smoothie an A+ with every member of my household. We have literally been having this smoothie almost every day for the past few weeks and it never seems to get old. With the rush of the school day mornings, it can be easy to forget to offer something green so this gives me bit of mama peace amidst all the rushing. This isn't one of those super sneaky green smoothies that has a bunch of odd flavored veggies that you're trying to mask. This is simple, delicious and so refreshing. My mom told me a story about how her grandfather used to make a smoothie for her and her cousins out of fresh lemons and papayas straight off the tree. She also happens to have one of the most delicious lemon trees in her own garden so we re-created it in her kitchen together. As soon as I tried it, I was hooked. The wheels in my head started turning and I of course decided to put a green spin on things. This smoothie is packed full of vitamin C, potassium, iron and fiber. Papayas are also famous for aiding in digestion because they are literally packed full of digestive enzymes. Digestive enzymes break down our food into nutrients, so that our body can absorb them and use them for energy. I promise you won't have to bribe your kids to drink this smoothie, they are going to love it. Here's how to make it. Keep in mind that the measurements are made to serve 3-4 people (we all share), so if its just for one or two people, then cut the ingredient list in half. Method: Add all ingredients to high powered blender, add OJ at the end to determine how much extra liquid is needed. Keep in mind that papaya yields a lot of liquid. Blend until smooth. Enjoy!